the best fleet program dedicated to landscapers. 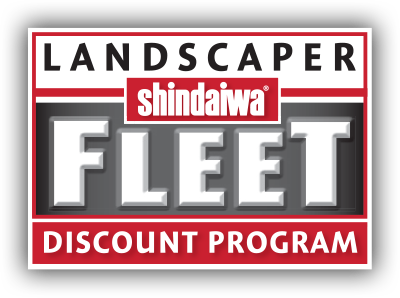 The brand new Landscaper Fleet Discount® Program rewards your commitment to Shindaiwa and ECHO quality with deep product discounts and “no-hassle” financing. This flexible program allows you to start saving money on equipment, attachments and accessories with a low initial $2,500 purchase. With two tiers of discount you will save more as you bundle your purchases - including BOTH Shindaiwa and ECHO products. Deep discounts starting at 16%! Simple and quick financing - gets you the equipment you need quickly and painlessly. Discounts apply on ANY combination of Shindaiwa and ECHO products, attachments and accessories. Low qualifying purchase - only $2,500 - higher discounts apply at $5,000. Discounts apply for 12 months. Fleet discounts cannot be combined with any other offers.